Equity markets struggled to find direction in Asia as the second half of the year kicked off, tracking mixed signals from U.S. markets. Market participants were expected to focus more closely on the Chinese bond and currency markets with the launch of a new program allowing global investors to invest in the world’s third-largest market for fixed income via Hong Kong. 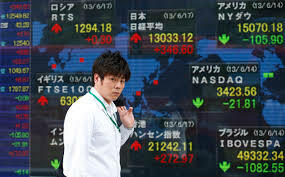 The Nikkei Stock Average NIK, +0.26% was up 0.2% in morning trade, recovering from a near 1% drop at the end of last week. South Korea’s Kospi SEU, -0.24% , which logged the largest quarterly percentage gain since 2009 last quarter, was trading flat. Australia’s S&P/ASX 200 XJO, -0.36% , Singapore’s Straits Times Index STI, +0.14% and Taiwan’s Taiex Y9999, -0.12% were also flat. “We have some positive leads coming from last Friday because we had some risk off [sentiment] and a slight reversal in U.S. markets means that markets are still broadly supported,” said Jingyi Pan, a market strategist at IG Group. In the U.S. on Friday, the Dow Jones Industrial Average closed 0.3% higher, the S&P 500 climbed 0.2% and the Nasdaq Composite slipped 0.1%. Still, there wasn’t a lot of data on the calendar to drive movement and Asian markets were likely to consolidate for much of the week, Pan said. Gains in Japan’s market come as business confidence among the nation’s large manufacturers strengthened to its highest level in more than three years in the second quarter, according to a central bank survey, as a pickup in the global economy and renewed strength in stocks brightened the outlook for corporate Japan. The main index measuring large manufacturers’ confidence rose to plus 17 in the April-June period from plus 12 previously, according to the Bank of Japan’s quarterly tankan survey. In China, markets shrugged off yet another strong reading of manufacturing data for June. The Caixin manufacturing purchasing managers index for June, released Monday, came in at 50.4 versus 49.6 in May. A level above 50 indicates economic expansion. This followed stronger-than-expected official PMI data last week. The Shanghai Composite SHCOMP, +0.04% was off 0.3%, while the main Shenzhen board 399106, +0.28% was down 0.2%. Monday also marked the launch of a bond-trading link between Hong Kong and China, which opens up the mainland’s domestic bond market to foreign investors. The move could result in an initial capital inflow of up to $250 billion, according to Ping An Asset Management. Still, that would be a tiny fraction of the country’s $9 trillion bond market. Goldman Sachs recently said that as of the end of March, the total amount of Chinese domestic bonds held by foreign investors was around 830 billion yuan ($122 billion). Meanwhile, the Chinese currency held steady against the U.S. dollar early Monday after the People’s Bank of China fixed the yuan near its highest level against the dollar since November. The central bank set the dollar’s midpoint for daily trading at 6.7772 yuan compared with 6.7744 on Friday. In Hong Kong, after the best first-half performance since 2009, traders expect momentum to ease this month. The Hang Seng Index HSI, +0.08% in Hong Kong was last down 0.1%. Among key locally-listed stocks, Macau casino operators underperformed after gaming revenue growth for June rose 26% from a year earlier, compared with expectations from analysts of more than 30%. Galaxy Entertainment 0027, -3.16% and Sands China 1928, -1.82% dropped 3.8% and 2.5%, respectively. Oil prices were higher in Asian trading. Prices were supported by the first net decline in active U.S. oil-drilling rigs since January last week. “One report doesn’t start a trend but signals apprehension by oil companies as profit margins diminish,” said Stuart Ive, a client adviser at OM Financial. Gains could be capped today by reports that Libya’s daily oil production has topped 1 million barrels. August WTI CLQ7, +0.35% was recently up 0.3% at $46.18 a barrel, while Brent LCOU7, +0.21% added 0.2% to $48.85.